It's hard to believe that it is already October! This month is generally dedicated to Halloween and I can already see decorations around town. At our house, we get our pumpkins carved, costumes picked out and of course, the mountain of candy to hand out to the cute trick-or-treaters in the neighborhood. Many times, the kids are not only accompanied by an adult, but also their dog. There's nothing cuter than a dog in costume. How nice would it be to have a special Halloween treat just for them? Check out this cute idea for an easy goodie to hand out to the furry visitors-- Dog Treat "BOO"quets. Assorted dog treats. I used Milo's Kitchen, Pup-Peroni and Milk-Bone treats. For your cellophane bag, you can trim the top to the size you want. I then fill the bottom of the bag with small size Milk-Bone treats, about 6 of them. I add enough of the chewier type treats that were skewered on sticks and gather them in the center and tie off with a bag tie. Those generally come in the package of cellophane bags. Next I add a couple decorative picks. I was lucky to find some cute ones from the Halloween cake decorating section of the store that matched my theme perfectly. You can also make them very spooky by using little skulls, spiders or ghosts. The final touch is tying the bouquet with Halloween themed ribbon. The end result is super cute BOO-quets that dogs will love! I am quite sure their pet parents will love you for thinking of their fur baby. 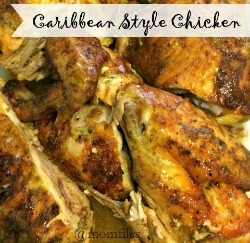 This is a very easy craft that you can do with your kids. You can also use alternate materials like tulle, tissue paper or paper you want to repurpose. Be creative, it's all about treating our doggie friends! There are many varieties of Big Heart Pet Brand of dog treats available at Walmart stores to add to your special DIY Halloween dog goodies. 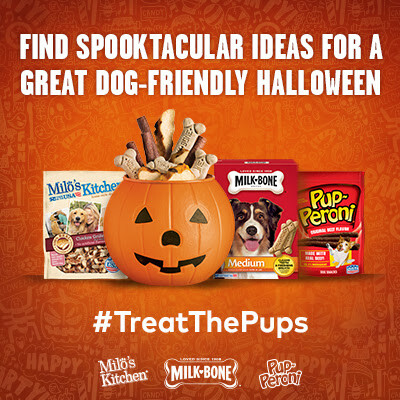 If you need some inspiration, be sure to check out the Walmart site dedicated to DIY Halloween dog treats. There are so many simple ideas. So go ahead and take a peek. 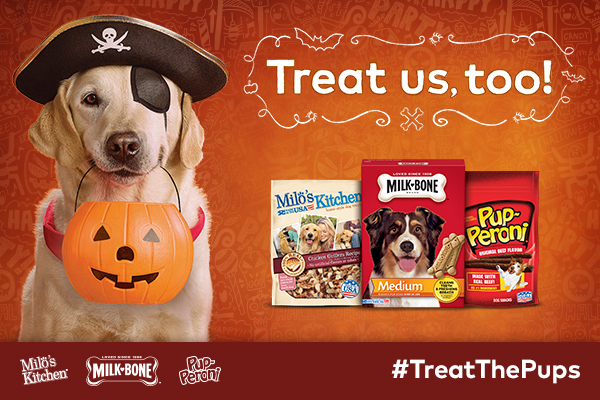 How will you #TreatThePups? Look at those yummy pooch pops! My inlaws' canine crew would love 'em!